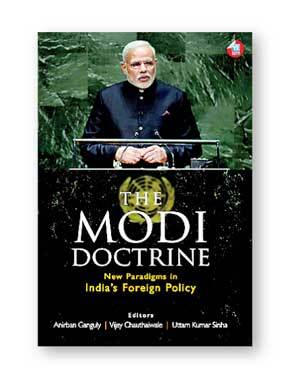 Institute of National Security Studies Sri Lanka (INSSSL) Director General and visiting lecturer Asanga Abeyagoonasekera has contributed a chapter to a new book entitled ‘The Modi Doctrine: New Paradigms in India’s Foreign Policy’. External Affairs Minister Sushma Swaraj on 13 August released the book which was edited by Anirban Ganguly, Director of the Syama Prasad Mookerjee Research Foundation, Vijay Chauthaiwale, in charge of department of foreign affairs in the BJP, and Uttam Kumar Sinha, a Fellow at the Institute for Defence Studies and Analyses. The visiting British Secretary of State for International Development Priti Patel, who is of Indian origin, was also present for the release. There were 20 distinguished scholars and experts on foreign policy, geopolitics from around the world who contributed. From Sri Lanka Abeyagoonasekera’s paper on ‘India and Sri Lanka: Right Leadership at the Right time’ was selected. During the launch of the book a panel discussion was held with the participation of Shakti Sinha, Amb. Tariq Karim, Dr. Uttam Sinha, Asanga Abeyagoonasekera and moderated by Manoj Ladwa. The book is published by Wisdom Tree and will be available in bookstores around the world.